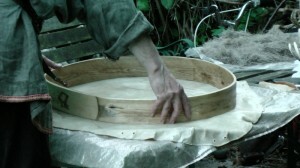 Having felled the tree, made the hoops and cured and stretched the hide, now it's time to bring them together and actually make the drums in this, the third and final part of my little beginner's guide to drum-making . I began by soaking the hide for a few hours. When good and wet, I laid it out rough side up, flat on a table. I then placed the first hoop, the larger of the two, on the hide and drew around it with a soft pencil. Then, using a little jig made out of a scrap piece of frame wood, I marked another round, 4” out from the hoop. This allows for the 3” depth of the hoop plus another inch to overlap. Next, I cut around the outer pencil marks with a sharp pair of scissors, following which it's time to punch the holes to thread the rawhide cord through. This is done with a leather punch set to its largest hole size. What you want is 32 holes in 16 pairs. First, fold the skin in half. This gives you two opposite sides you can punch two holes each through, about an inch apart and about a half-inch in from the edge of the hide. Next, fold in half again so that the two pairs of holes you've just punched match up with each other. At either end of this second fold, punch another two holes. Now fold the hide in between the sets of holes you've already punched, lining them up with their opposites. Again, at either end of your fold, punch two more holes. Keep doing this until you have 16 sets of evenly spaced holes around the edge of your hide. 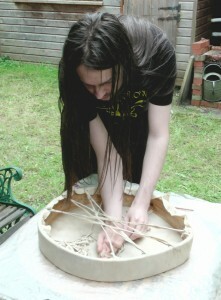 Having cut out and hole-punched both drum-skins, back they go in the bin of clean rainwater to soak. 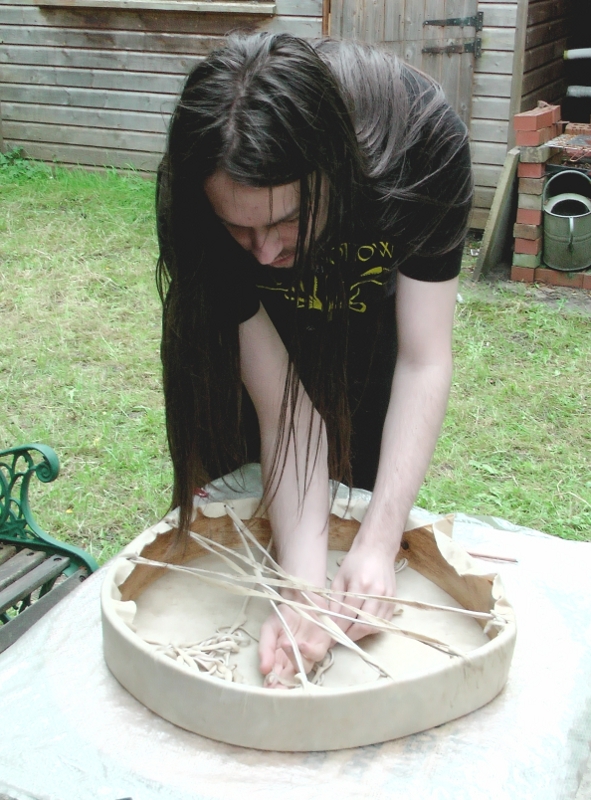 Having a fair bit of spare hide left, the next stage is to cut the cord you'll use to bind the skin to the drum hoop. Take your sharp pair of scissors and cut strips of hide about a quarter to half an inch wide. 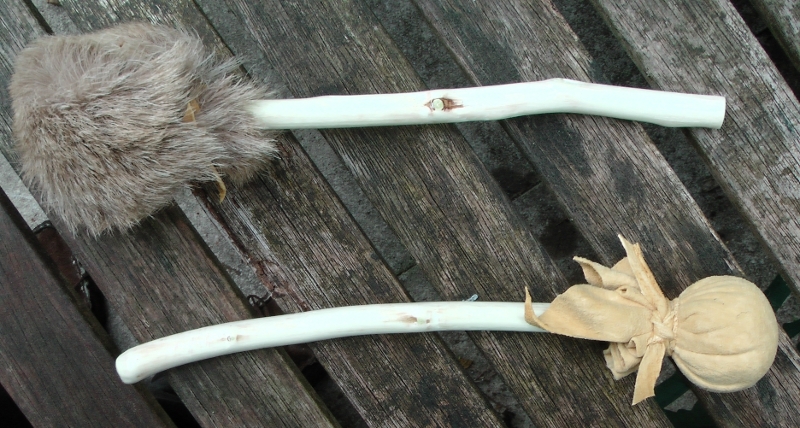 It helps if you leave a wider tab at one end, cut in the shape of a leaf and with a hole through the middle of it. The cord will stretch to a lot less than its original width when you come to use it, but it needs to be narrow enough to fit through your punched holes. Cut the strips as long as you can. You're going to need several yards to do a drum and it needs to be one continuous strip. It may help to know that rawhide cord is incredibly tough. You can test its strength for yourself. Cut a strip about a yard long and the width you're going to use on your drum. Now grab one end in each hand and pull for all you're worth. If you've got your curing right, you'll be amazed at how strong it is. When you've cut your cord, pop it back in the tub to soak. 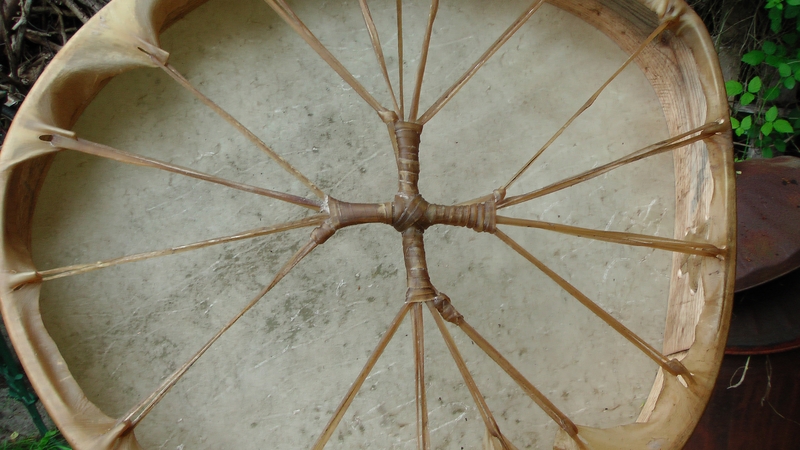 Lay the hide flat on the table again, rough side up and, using your pencil marks as a guide, position your hoop on it. Now grab the edge of the hide on opposite sides of the hoop and pull to stretch it. Do that all the way around. 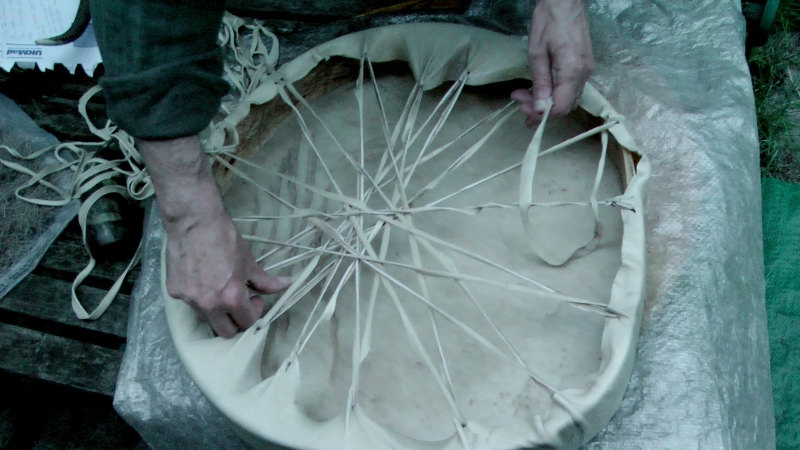 Then start pulling the hide up over the rim of the hoop. Again, do this all the way round. Now you're ready to start threading the cord through your pre-punched holes. Take the end with the tab on it and poke it through a pair of holes on one side of the drum. Then take the other end of your cord, locate the pair of holes directly opposite the ones you've just threaded through and pass the other end of your cord through them, pulling the whole length through. OK, from here on you need to watch this video, in which Salish drum-maker, Jorge Lewis, gives perfect teaching on how to thread a drum. This is the video that taught me how to do it. Follow it carefully and take notes as you go. It's the best teaching video I've ever seen. 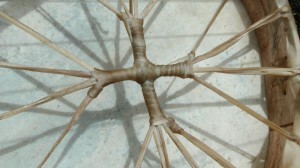 Jorge Lewis reminds me of an aspect of drum-making that I haven't emphasised enough, which is the ritual that accompanies every stage of the process, from communicating with the tree spirit before felling the tree from which the hoops are made, through acknowledging the death of the deer whose hide will be the drum's skin. I fluted for the deer when the hide was lain in the brook at Wild Ways to be washed, and again when it was washed in the brook that runs past my house after being cut to size. 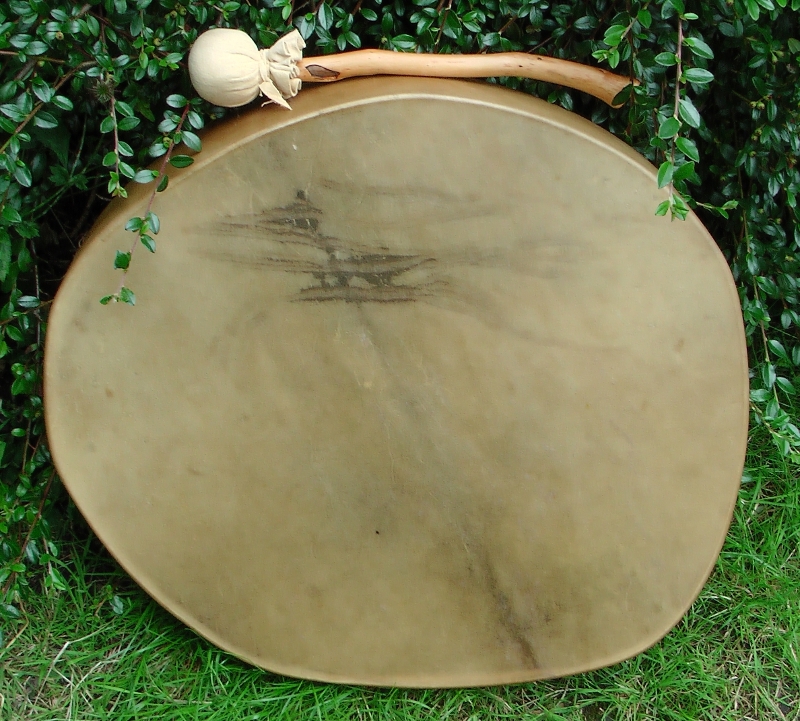 I drummed with my previous drum and shook my rattle to call in good spirits to the hoop and hide. I placed scented herbs around the bin in which the hide was curing. Every step of the way there was ritual, music, communication with the spirits of tree and deer and prayers to the spirits of the brooks and the old gods of our lands. Without these things, you can still produce a drum, but it will not live. 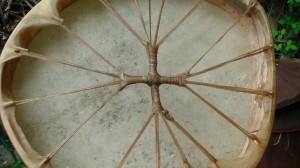 A vital part of the process for me is the knowledge that the tree and the deer that have given themselves to make the drum will live on and sing on through it, that their spirits will enable this drum to communicate with other spirits as its song passes between the worlds. The drum is a ritual tool of great power. Of course there must be continual ritual throughout its making. For me, a personal pleasure of threading the hide onto the hoop was having my son, Joe, help me (right). He proved very adept and will soon be beginning the journey of making his own drum. My youngest son, Mike, took pictures as we worked. One thing about being a beginner drum-maker is that there's no way of knowing if you've got it right until the drum is not only finished but fully dried. The latter was achieved by hanging that first drum from the washing line in my garden, using the extra length of cord left over as per Jorge Lewis' instructions. Then it's just a question of waiting. Of course I found myself nipping out every half hour or so to check if it was dry yet. It took a while, but finally I could find no damp spots at all, not even in the cross-shaped wraps that form the drum's handle and represent the four directions and their associated elements. Then came the testing moment. I took the drum down from the line, took a beater in my hand and tried it for the first time. It sang! Not only did it give a good, strong sound, but that sound continued to reverberate for a satisfyingly long time after the first strike. It sounded beautiful, magical, powerful. I played some more. Woohoo! I'd made a drum! No words can express the heart-leaping joy, the sheer sense of soaring elation, that discovery produced. That wonderful moment made all the work inexpressibly more than worthwhile. Joe and I set to and made the second, smaller drum. This had to dry overnight and ended up hanging from the stairs in our house. Again, the result was a beautiful drum with a deep, rich tone. Next comes the process of developing a relationship with the drum. This is achieved, of course, by playing it. 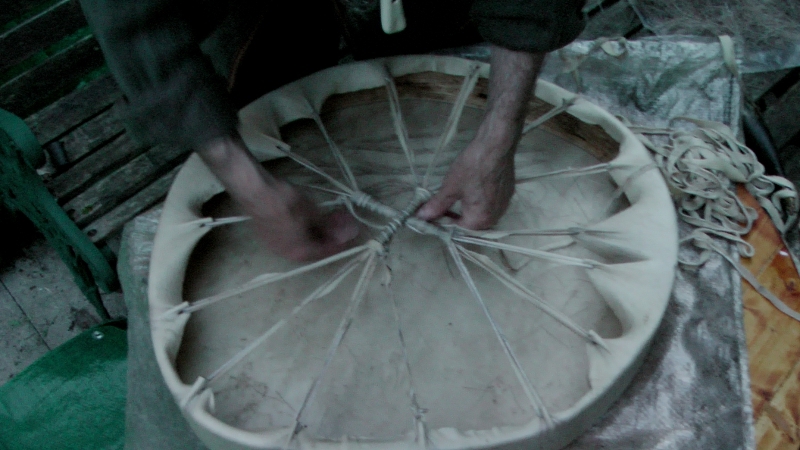 Because of the way these drums are made, they are never circular but always roughly egg-shaped. This means that different tones can be created by playing towards the edge of the skin where the drum's width is narrowest, then moving round to where it's widest. The different thickness of the hide at different points also produces different tones. The beater can also make a huge difference to the sounds the drum produces. For this reason, I have two beaters (below right). One has a soft leather head stuffed with Red Deer fur. The head on the other is a piece of fur-on Red Deer hide with the fur on the outside. While the former produces a strong, powerful beat, the latter can be used to play very softly, producing a sound that has a hypnotic, deeply meditative quality. My drum, the first one I made, averages a little over 21” in diameter, which is quite large. Because of its size, its basic tone is a deep bass note very like that of my previous drum, a 22” Remo Buffalo drum that I came to call my thunder-drum (below). My Red Deer drum is also a thunder-drum. However, it also produces a wide range of overtones that cover a broad sonic spectrum. 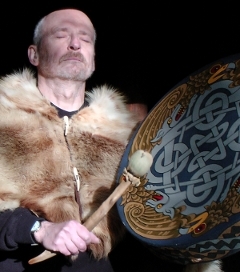 Playing the drum in ritual is another vital part of the process of getting to know it and learning to work in harmony with its inhabiting spirits. 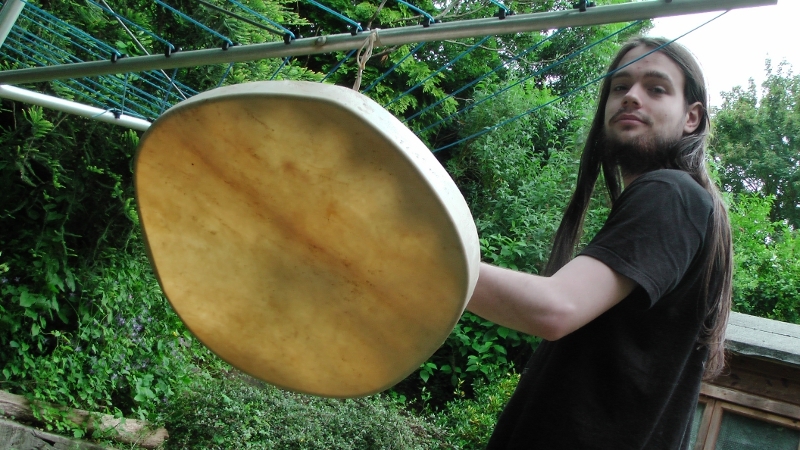 My drum and I have been to my heartland, the Avebury stone circles (see the video below), have played with the ancestors in the West Kennett Long Barrow, have played for the spirits of the brook that runs past our house and with the spirits of place where we live. We've travelled together to and within our beautiful Shropshire roundhouse and the surrounding woodland. Just recently, we've returned from a much longer journey to the Pacific Northwest of the USA. There I had the honour to drum with the Quileute Drum Circle, accompanying sacred masked dances that tell the legendary history of the tribe. While staying on the Quileute Reservation, in the village of LaPush, I drummed and sang on beautiful beaches overlooking the great Pacific Ocean and the drum helped restore and strengthen spiritual connections I once thought lost. But that's another story for another time. One decision yet to be made is whether to paint my drum or not. It has patterning on it already, both from the darker colour where the stag's strong spine ran and where that line is crossed by strange striations (upper left). 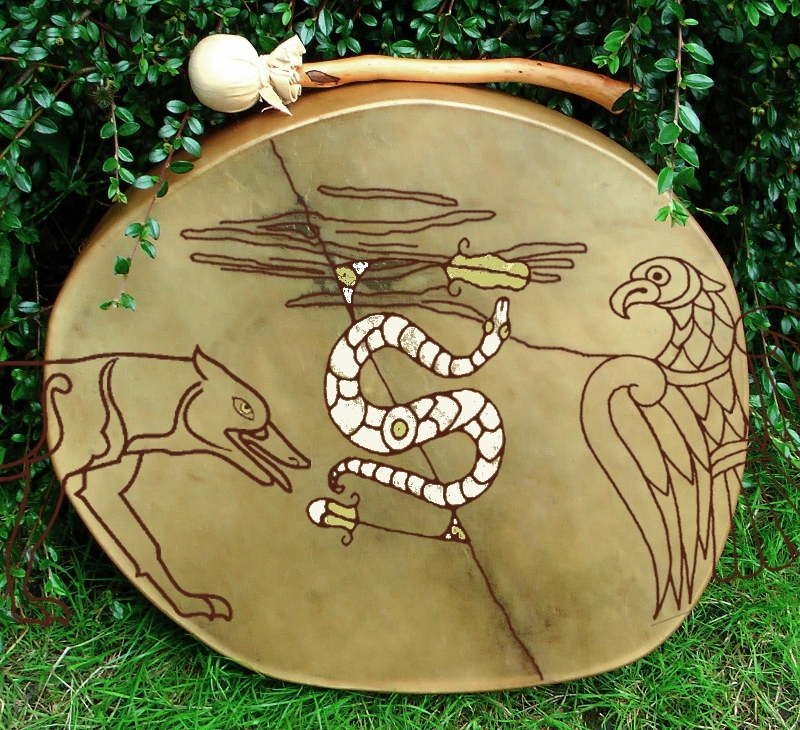 My previous drum was painted all over with a design incorporating wolves and eagles (see the image above), two creatures I've worked with in spirit for many years. For this one an image of a white serpent keeps returning. For me, as for our ancestors, it represents healing and the renewal of life and energy. There's a Pictish engraving that shows it well and in a style that might work for my drum. Here, computer software comes in useful. I can experiment with designs without actually committing them to the drum skin. Here's a possible decoration, incorporating a Pictish wolf and eagle as well (lower left). In the meantime, I've treated it by gently rubbing neatsfoot oil into the ties on the back, sides and upper, playing face of the skin with a soft cloth. Olive oil apparently works just as well. 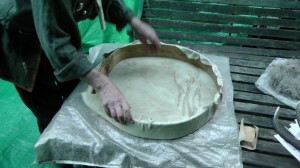 Oiling the drum skin helps preserve it and reduces the extent to which the drum's tone changes in moist conditions. Being a natural hide, it will still change with variations in moisture and temperature. If it becomes too loose to play, hold it near an open fire or other heat source for a moment or two or aim a hair dryer at the playing surface. This will bring it back to playability. If it goes the other way and is getting too tight and dry, carry a little spray water bottle in your drum bag and use it to spray the inside of the drum skin, the side you haven't applied oil to, as this will absorb moisture better. This will stop your skin from splitting and bring its tone back down. With care, I'm told these drums should still be playable a hundred years from now, so they could pass from you to your children and to their children and still be singing strong and true. I am getting to know my drum and its spirits are getting to know me. I pray that we will deepen and strengthen our connections through many years to come. I give thanks to the spirits of my ancestors, whose voices have sung to me during the making and the playing. I give thanks, of course, to the spirits of the Ash tree and of the Red Deer stag. I honour you, kinfolk of the green world and the great forest. I give thanks to the old gods whose powers have strengthened and supported us on our journeys. May they continue to bring us strength and guidance through all our days and help us bring their wisdom and the powers of healing to our kinfolk and our tribes. massively inspiring article I had the blessing to be led to. 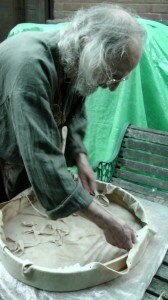 I have been led on a journey of drum making for a couple of years, along with my special fellow drum circle members. We have made several drums ourselves but have recently turned towards all the separate elements from tree to completed drum rather than buying in the skins and hoops already prepared. So much more spiritually fulfilling way of going about it. So finding a spirit such as yourself to learn from is an honour indeed. Blessings and much humble gratitude to you. It is quite a journey, isn't it? Thank you, Philip, I wish your video were still available! I've only used Red Deer, which I find works really well and has a richness of sound that I like. I'm told that Horse and Buffalo is thicker and produce a deeper tone, though I've not worked with them myself or played drums made from them. Another way to give a deeper tone is to make a deeper hoop. Mine are about 3 inches, which is good compromise between depth of tone and ease of carrying.